All aquatic bodies in the world, from the smallest forest ponds to the open ocean, house complex and diverse microbial ecosystems. When it comes to things such as number of species and carbon and nutrient turnover, unicellular organisms completely dominate many aquatic ecosystems, and organisms on the size scale of fish are only minor players, contributing little to the overall balance. In environments dominated by open water, such as marine systems and those of large lakes, most of the photosynthetic activity is carried out by microscopic phytoplankton cells. In many ways, the microbial biota is as fascinating and complex as the apparently more flashy systems of tropical forests or coastal marine macroscopic ecosystems. FIGURE 13.1 The diversity of the microbes represented by four genera, not drawn to scale. (A) Diaphanoeca, a flagellate with a smooth flagellum and a "cage" around the cell that increases the drag on the organism and thus the filtration efficiency (see Section 13.4.2). (B) Paraphysomonas, a flagellate with one short, smooth flagellum, one hispid flagellum (see Section 13.2), and a cell body covered by silica spikes. (C) The ciliate Tintinnidium incorporates agglutinated material into its lorica and has most of its cilia confined to its anterior end. (D) Pleuronema has a cell body entirely covered by cilia. that occupy apparently similar niches coexist. As in other ecosystems, the peculiar characteristics of microbial ecosystems are nothing but a sum of the characteristics of each of the individual organisms of which it is composed and their response to the prevailing environment. Unlike systems of larger organisms, however, the micro-bial biota benefits from an absence of complex behavioral responses. Because of this, the characteristics of these ecosystems can in principle be understood directly from the mechanics and physiology of the individual organisms and their (to a large extent) predictable responses to stimuli. In this chapter, I review some aspects of the existing knowledge on this topic and present some new calculations. I focus on pelagic systems and organisms that swim by cilia and flagella, which is the case for almost all motile pelagic microbes. I do not consider factors affecting the photosynthetic rate of autotrophic protozoa but deal only with the heterotrophic aspects of the microbial ecosystem. Unlike larger organisms, the distinction between autotrophic and heterotrophic in the micro-bial world is not clear. Many heterotrophic flagellates also contain chloroplasts ; even within the same species, there may be individuals with or without chloroplasts. However, because autotrophic flagellates are capable of ingesting particles at rates similar to those of apochlorotic flagellates [2,3], in this review they are grouped together with the rest of the heterotrophic flagellates. 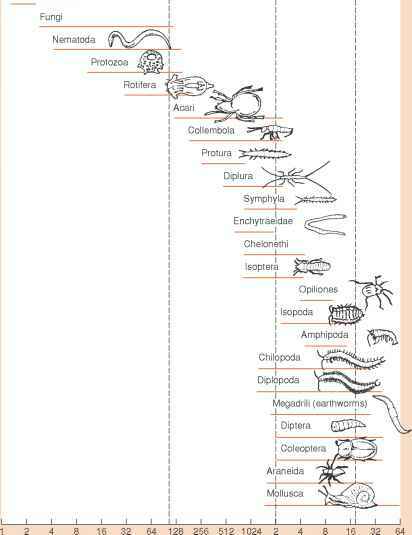 It is well known that the classical textbook food chain of phytoplankton being eaten by copepods being eaten by fish and so forth is a huge oversimplification and describes at best only a minor part of the aquatic food chain . Depending on conditions, 1 to 60% of the phytoplankton primary production is lost immediately as dissolved organic matter (DOM), probably mainly through lysing of phytoplank-ton cells [5-7]. Because of their small size and thus high surface to volume ratio, bacteria are highly efficient in the uptake of DOM , and the bacterial production based on phytoplankton exudates can be as much as 18 to 45% of the primary production. Heterotrophic protozoa such as flagellates and ciliates are efficient grazers on bacteria and other small particles. Through their large numbers and high volume specific grazing rates, they are capable of clearing 3 to 100% of the entire water column for small particles per day. The average values lie between 7 and 90%, depending on the area studied [9-12]. Much of the grazing seems to be carried out by minute eukaryotic organisms not much larger than bacteria ; this, however, varies. Flagellates are generally shown to be the most important grazers on bacteria; ciliates, like flagellates, mainly graze on larger particles, but ciliates can also be important bacteriovors . The importance of heterotrophic microorganisms in the ocean seems to vary with the season; they may mainly be important after the spring bloom under summer stratification when the phytoplankton is dominated by small forms . Bacterial numbers remain fairly constant over time in marine systems, being typically around 0.5 to 3 x 106 ml1; fluctuations in nutrient and DOM availability are apparent instead in fluctuations in the numbers of bacterivorous protozoa. FIGURE 13.2 A much simplified version of the pelagic ecosystem. Black solid arrows indicate the classical food chain. Open arrows with a solid line represent the microbial loop functioning as a link that returns DOM to the higher trophic levels. Gray arrows show how the microbial loop can function also as a sink, which results in a higher number of trophic levels and thus higher respiratory costs. Open arrows with dotted lines show ingestion by heterotrophic phytoplankton. Thus, the bacterial communities seem top-down controlled by grazing rather than limited by nutrients [4,9,10,13]. 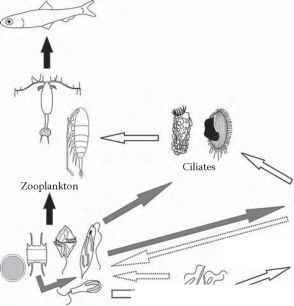 Flagellates may, for example, be consumed by ciliates that are in turn consumed by larger organisms such as copepods. Thus, the carbon originally lost as DOM is returned rather inefficiently to the traditional food chain through what has been denoted the microbial loop (Figure 13.2) . 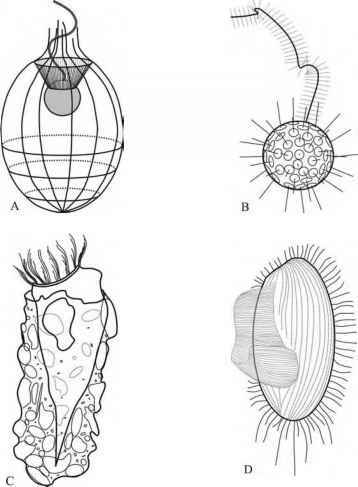 In this way, protozoa form an important link from the DOM to higher organisms. They do not, however, specifically prey on bacteria but instead ingest particles in the right size class, and many flagellates are capable of ingesting particles their own size or in a few cases even larger, (e.g., see Refs. [14,15]). Small phytoplankton cells as well as other protozoa may be ingested as efficiently as, or even more efficiently, than bacteria [14,16-18]. Thus, protozoa may also function as sinks removing carbon from the system through increasing the number of trophic levels and so respiratory costs (Figure 13.2). Whether protozoa function mainly as sinks or links depends on the relative abundance of bacteria and small phytoplankton.